122. Aktion (2005), The Making Of: Mit Leib und Seelen (2010) and 130. Aktion (2010), videos. Hermann Nitsch, videos 122. Aktion (2005), The Making Of: Mit Leib und Seelen (2010) and 130. Aktion (2010), exhibition view at the VENICE INTERNATIONAL PERFORMANCE ART WEEK 2012. Born 1938 in Vienna (Austria). Related to the Vienna Actionists, Nitsch's existential and ritualistic actions work on controlled violence and organic mutilation. Nitsch conceived the "Orgien Mysterien Theater" in the 1950s, staging nearly 100 performances between 1962 and 1998. The 122nd Action, held by Nitsch at Vienna's Burgtheater, is not just a re-reading of ancient ancestor ritual Man/Nature, but an example on how the performer’s body is used to lose any ego demands. Being one with animals and plants, the performer's body transforms dramatically towards a sense of holiness: it is in this moment - the durational moment of the ritual - that the performer’s body hybridizes in the endurance process to become other from itself. 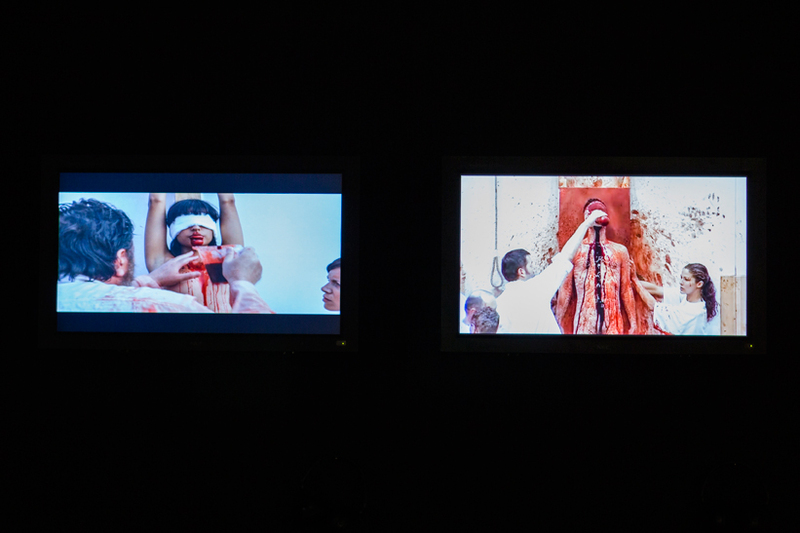 At VENICE INTERNATIONAL PERFORMANCE ART WEEK Hermann Nitsch presents the videos 122. Aktion (2005), The Making Of: Mit Leib und Seelen (2010) and 130. Aktion (2010). Courtesy of the artist and GAA Foundation.